IT WAS upon the frozen tundra of Greenland's ice cap that Bridget Kruger - raised among the farmlands and brigalow scrub of The Gums and schooled at St Ursula's College in Toowoomba - truly learned the limits of her body. 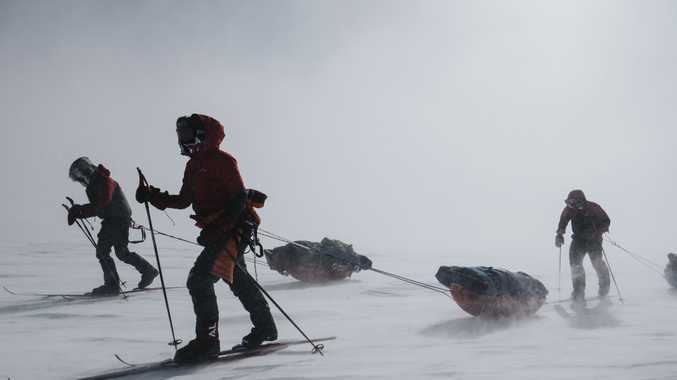 Following in the footsteps of the Norwegian explorer Fridtjof Nansen, the first man to cross the Greenland ice cap back in 1888, Ms Kruger and her fellow expeditioners set off in May from Kangerlussuaq, a small town on Greenland's west coast, on a 29-day, 560km trek transecting the country. Miss Kruger had been selected along with three other young explorers as part of the New Zealand Antarctic Heritage Trust's third Inspiring Explorers' Expedition from nearly 200 applicants. It was a brutal journey. 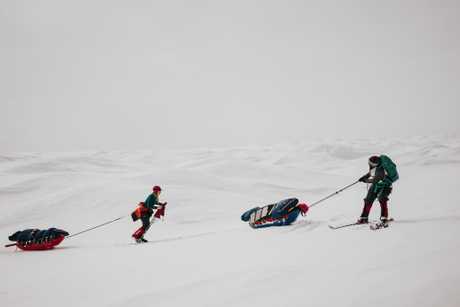 Battling temperatures of down to -40 degrees, and towing a 60kg sled behind her, the barren, unending white landscape stretched her mental and physical endurance like nothing before. "It was a world of vast nothingness and the best way to describe it is to imagine being on the inside of a ping pong ball, white stretching out all around you," she said. "Some days the blizzards were so intense you didn't even know where up or down actually was. You just felt like you were floating in a cloud, waiting to fall out of it." 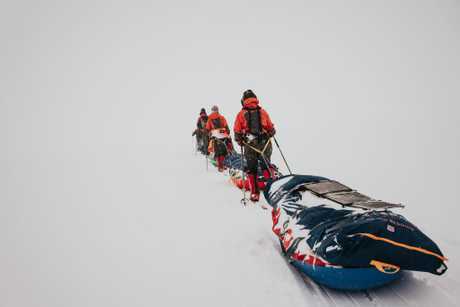 What began as eight-hour days turned into 16-hour-long slogs across the ice. Fatigue set in. Chest infections and gastro swept through their team of six, and the extreme temperatures gave Miss Kruger frostbite. The chest infection caused her to cough up blood, daily, for an entire week. "I was absolutely exhausted," she recalled. Symptoms of a traumatic head injury she received years previously began to manifest, causing her to lose her balance and fall over. It was in 2012 that Miss Kruger was guiding a dog-sled trek through the Canadian wilderness when the six-sled team came to a rest before a "huge cliff face, that opened up to this beautiful panoramic view". She was taking a photo of some of her clients, and behind her, another client who was on his own sled, had left his snow brake off. The first three sleds took off, and the dogs strapped into the client's sled followed. "His dogs started running toward the back of my sled. I thought, oh my God, that's not good. My dogs started to run, and I began running alongside it and leapt to jump onto it to control it. 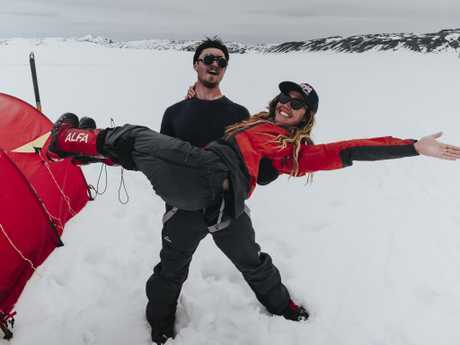 His sled caught up with me at that point and ran over my head - 250kg, with two people on top of it," she said. She came to, and watched her sled going down the cliff. Panicking, she radioed the people in front of her to try stop it. "Then I noticed around me there was blood all over the ground. I did a pat down and reached up to my head and realised it was bleeding. Another guy came and clamped my head together, basically," she said. "And yeah, by the time I got to hospital - we were a little delayed because we were out in the wilderness - I started to go downhill. I started losing my short-term memory. The sled had hit me and cut me open all across my ear. My vestibular system was severely damaged during that accident." Miss Kruger's recovery took nearly a year. The first three months she spent sleeping, on and off, as her brain repaired itself. Another six months of physical therapy was required to get her balancing properly again, allowing her to walk. Yet out on the ice cap, those years of rehabilitation were stripped away. She felt like a burden. "Now my brain injury affects me mostly when I am tired. My body goes into survival mode, it shuts down everything that isn't needed to function including my personality," Miss Kruger said. "I lose my sense of balance and tend to fall over a lot. My vision becomes foggy and my brain feels like it is on fire. I find it incredibly hard to concentrate on anything at these times and noise or over stimulation acts like a knife being stabbed over and over within my skull. "I was way beyond my limits. I had to pull strength from nowhere." 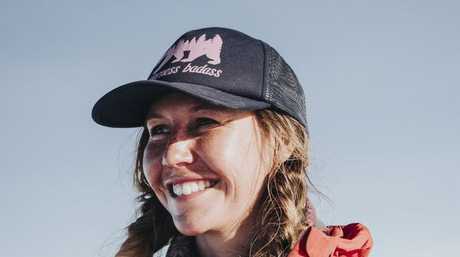 Fortunately, her tent-mate, a Kiwi by the name of Hollie Woodhouse, as well as the other members of her expedition, helped her see through her misery. "The team I was with were absolutely amazing." Miss Kruger might have reached her limits, but she had also discovered what she was capable of. "You walk for 50 minutes at a time, and take a 10 minute break to eat as much as possible. If I started to think negatively within that hour before the break, that whole hour would be the hardest thing on earth," she said. "So the trick was to think good things - I remember I thought for nearly three hours about haloumi cheese, and that made me really happy. Those three hours were the easiest. "You had to find the motivation. It was absolutely gruelling." Part of the Antarctic Heritage Trust's mission is to encourage the spirit of exploration - and it was Miss Kruger's work with young children that saw her selected for this year's Greenland expedition. "They wanted to give us an experience, putting us out of our comfort zones and putting us into the footsteps of the older explorers, and to give that back to the kids," she said. It was after the trek that she was in the Norwegian city of Oslo, dragging two heavy bags around the cobblestone streets, that the enormity of her accomplishment set in. "I stepped onto this bus and there was this woman getting onto the bus at the same time - in a wheelchair - and I felt so grateful that after my accident, I still had use of my body and was capable. I felt so incredibly lucky to have done this (expedition)," she said. Now back in Australia, Miss Kruger has plans to work with young women, running empowerment programs and female retreats at various locations around the world. Next week, she will head to Ramsay State School, and to the Western Downs, back to where it all began, giving speeches to young students at some of the region's smaller primary schools - The Gums, Meandarra, Moonie, and a couple of others. When she was a young student at The Gums State School, she recalled a visit to the school by a man who enthralled her and her classmates with tales of Antarctica, and filled their minds with images of a wider world. Now, she hopes to do the same for the next generation. You can visit Miss Kruger's website and read more about her journey here.